Staycations start with "Swimming Pool"
Vacations are made for relaxing by the pool. On vacation you can let the stress of everyday life melt away as you enjoy carefree time of rejuvenation. When you invest in your own pool, you don’t have to go on vacation to enjoy all of these things. All you have to do is step out your back door. You have all of the makings of a 5 star vacation right at your fingertips. We have put together some of our best tips for creating a perfect vacation vibe in your backyard so you can enjoy a staycation anytime the mood strikes. If you are wanting your backyard to have that dreamy vacation feel, then you will want to start things off right from the beginning. Putting in a standard run-of-the-mill pool isn’t going to cut it. You want to pack your pool with the best features money can buy. Fountains, tanning ledges, slides; those are the things that make resort pools feel so luxurious. Adding some of those amenities to your backyard pool will give it a vacation-feel right from the start. When planning for a true staycation it is always fun to add special ambiance to your usual pool area. Adding unique lighting, music and decor can create a great vibe. You can even pick a theme for your staycation. You could create a fun Mediterranean theme, spend a week on the French Riviera or create a Hawaiian getaway. Whatever you choose, make sure that your music, decor and lighting all support the theme so you really create that “getaway” feel. No vacation is complete without great food and drinks. Afterall, vacations are really about indulgence. You can enjoy all of the rich delicious food that you want without all of the guilt. Picking up fresh fruits and juices or scones from a local bakery give you a special breakfast with very little effort. Splurge on ingredients for everyone’s favorite cocktails or mocktails and set up your own poolside bar. All of these little differences are what will make your staycation feel like a getaway. One of the best things about a staycation is that you can take all of your family and friends along with you. You could invite a group of friends to enjoy the weekend with you, or invite a different set of friends over each night of your staycation. In addition to all of the relaxation, you will cherish the time that you spent making memories with the ones you love. 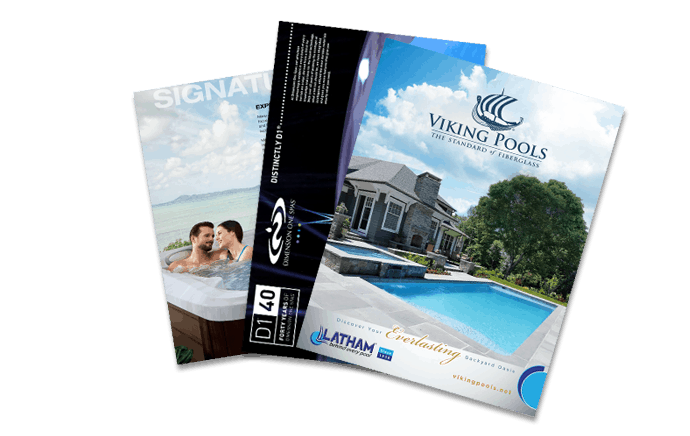 Whether you are planning a staycation with your existing pool or you are ready to start the process of building a vacation-like pool for future staycations, we can help make your pool vacation-ready. Head over to our pool gallery to start planning now.